All Events › Ready. Set. Christmas! A fun filled morning for kids (kindy – yr 6), giving parents time to get ready for Christmas. Morning includes games, craft, music, construction, pizza lunch and a look at the first Christmas. 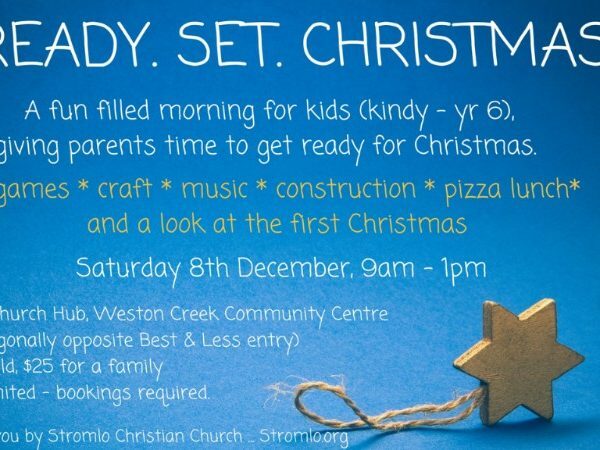 At the Stromlo Hub, Weston Creek Community Centre (entry diagonally opposite Best & Less entry). $10 per child, $25 per family. Spaces are limited and bookings are required.